TF2 Demoman? More like TF2: Highlander! Grab your nearest blade and howl "There can be only one!" Team Fortress 2's Demoman will be getting in touch with his Scottish heritage, trading his broken bottle and sticky bomb launcher for a claymore and targe. The surprises in the TF2 Soldier vs. Demoman: War! 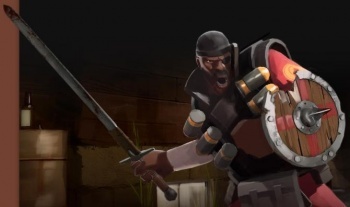 keep on coming: Since the Demoman is trailing the Soldier in kill count (but only by a little), Valve has unveiled his brand new item - a... sword and shield? Okay, I think I can safely say I did not see that coming. The Eyelander is unveiled in this five-page comic, introducing us to the Demoman's home life (and his real name, incidentally): A haunted sword "slow-forged for generations in the bowels of captured English kings," the Eyelander will go in the Demoman's melee weapon slot (naturally), replacing the bottle of scrumpy. From the way it's described on the site, equipping it will lower the Demoman's max health slightly (similar to the Scout's Sandman bat), but earning a kill with it will boost his health and speed in an effect that stacks up to four times. Replacing the sticky-bomb launcher, on the other hand, is a the Chargin' Targe, a shield that reduces fire damage by 50% and explosive damage by 65% - but as befits a crazy Scottish berserker, it's certainly not just defensive. Using the shield's Alt-Fire (i.e, right-clicking) will charge forward faster than even a Scout, and connecting with the charge will earn you a guaranteed crit or mini-crit. So charge, pull out that sword, and chop some heads. It's an interesting tradeoff, especially given how effective the sticky-bomb launcher is, even in the hands of an inexperienced player (and is the shield really worth giving up the grenade jump? Really?) but I can't say that it doesn't sound awesome. Of course, it's sort of hilarious that with the Sniper's Huntsman bow-and-arrow and now the Demoman's sword-and-board, it seems like the TF2 mercenaries are trading in high-tech weaponry for something more medieval. I'm not saying that I'd bet that one of the Soldier's unlockables will be a throwable rock; I'm just saying that we shouldn't rule it out. First crafting, now a sword and shield: Team Fortress 2 is now more like World of Warcraft than ever before! Seriously, if you're going to be playing as a Claymore-wielding Demoman, you better be listening to "Princes of the Universe" on repeat. This would also be acceptable, too.